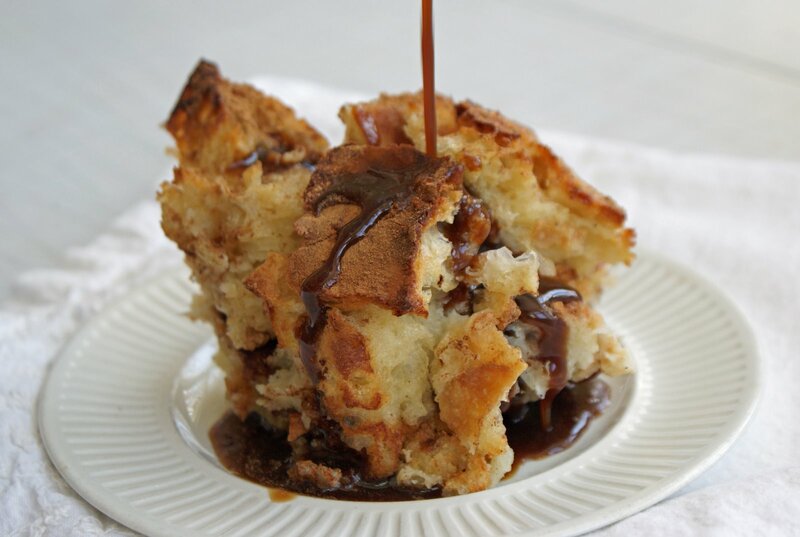 You can use any kind of milk - or even eggnog - to make bread pudding. Obviously the heavier the cream the richer it will be - but even using all 1% works just fine. 1Cut or tear the bread into 1” chunks in a large bowl. In another bowl, whisk together the eggs, honey, milk, cream and vanilla. Pour over the bread and let sit for an hour or two, stirring gently once in awhile. All the liquid should be well absorbed, but the bread shouldn't turn to mush (thus the good-quality crusty loaf). 2Preheat the oven to 400°F. Pour the bread mixture into a 9”x13” pan that has been sprayed with nonstick spray, or any baking dish that will accommodate the quantity you made. If you like, douse it with cinnamon. 3Bake for an hour or so, until puffed, golden and set. Serve warm or at room temperature. 4Espresso Syrup (adapted from Donna Hay's New Classics): bring equal amounts of strong espresso and sugar to a simmer in a small saucepan with a capful of vanilla. (Instant espresso works very well for this - just add it right to the pan.) Cook for about 15 minutes, until it has reduced slightly and has a syrupy consistency. Remove from heat. 5 If you like, add a splash of half & half - it won't make it completely creamy, it just sort of takes the edge off.